I have been a fan of Panasonic TVs since reviewing the 55CR852B back in 2015 and then previewing the immensely popular TX-65DX902B that used full array local dimming for the backlighting. Following the superb DX902B model, Panasonic was the second company to bring OLED to the market and have been nipping at the heels of LG for the past few years. Along with great panels, one of the stand out features of Panasonic has been the superb Firefox OS-based my Home Screen interface. It may not have the number of apps and customisation as Samsung Tizen OS or Android TV used in Sony models, but it is one of the quickest, easy to use and reliable interfaces out there. Based on the above, I was thrilled when asked to review the latest Panasonic 49FX750 LED TV which is sold by AO.com for £1,049 at normal price but currently on offer for £899. The FX750 range sits at the top of the pack for the LED options, with a big price jump from LED to the FZ class OLED models. The 49FX750 is also an interesting option too, while there are quite a lot of choices in the 49-inch category, but very few offer flagship performances. This 4K display is capable of displaying HDR using HDR10 and HLG via its 10-bit (8+2 FRC) panel. HDR extends the range of colours for enhanced realism. It also delivers brighter whites and darker blacks, helping to give this TV stunning levels of contrast. It is worth noting that Panasonic now uses IPS based panels for most of their models, with the 75-inch model being VA based. IPS based panels generally can’t get the same black levels as VA due to the way the pixels are aligned, but they offer better viewing angles and response times. The FX750 uses the same Hollywood Cinema Experience (HCX) processor as Panasonic’s 2018 OLED screens. The Local Dimming Pro which is advertised makes it sound like it is full array local dimming but in fact it is not, it is edge lit with local dimming. It is unfortunate that this is not FALD, but it is expensive to implement, and enthusiast level buyers will likely be better off with OLED nowadays. There is no Dolby Vision as it is only really LG that are pushing that in their displays. Just to be confusing, initial previews suggested this model had HDR10+ as did the Panasonic Press release in February, but the Panasonic product page doesn’t state it, nor do some retailers, while some do, such as AO.com. HDR10+ is the newer standard that aims to bring most of the Dolby Vision features to the HDR10 standard. From what I have read online, this is often just a firmware upgrade, it is planned for the EX series so it will definitely be on this years models. There is not currently a great deal of HDR10+ content out there, but Amazon Prime Video is the primary publisher of it with content such as The Grand Tour, The Marvelous Mrs. Maisel, The Tick and The Man in the High Castle. 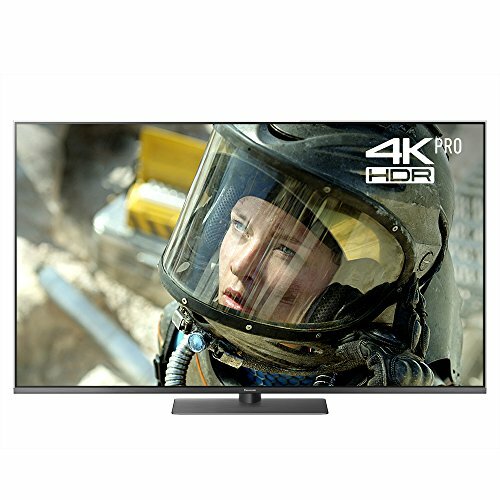 The branding on the TV is also a little confusing as they state 4K HDR Pro, but it seems this is the same as Ultra HD Premium which is a standard only the best TVs can achieve. Ultra HD Premium is often associated with TVs being able to hit a peak brightness of over 1000nits, but it is also possible to achieve if 540-nit peak brightness and less than 0.0005 nits black level is achieved. This is how OLED TVs can fit into this bracket. Panasonic is a little coy about the brightness levels achieved here, but last year’s model was rated at 550 nits, and this year’s model is supposed to be 20% higher some reports suggest that it is 600 nits. As is the trend nowadays, the FX750 is compatible with Google Home and Amazon Alexa. Google Home integrates with services such as Google Photos and Google Maps to make your TV an even greater source of entertainment. Currently, this feature is not enabled but will roll out shortly. You get twin tuners for Freeview HD, and Freesat HD and the UI used is Freeview Play giving you seamless access to catch up shows. If you connect an external HD you can get full recording functions saving you some money on an external box. If you are one of the few users that like 3D then you best look elsewhere, Panasonic made the sensible decision to get rid of gimmicks and no longer have curved or 3D TVs. There is not a great deal you can do to make a huge flat screen look good, but Panasonic does their best. The FX750 is fashioned according to the principles of Panasonic’s Art & Interior design ethos. Its mesmerising ultra-thin, all-glass frame and premium metal stand place it firmly at the forefront of LED TV design. In real life this does look impressive and feels ultra-premium, you don’t get that cheap plastic feel of other TVs. One word of warning though, this is heavy, the 49-inch model I have this weights 22kg without the stand, or 27kg with the stand. The Sony KD49XF9005 is over 8kg lighter at 13.6kg and the Samsung QE49Q6 weighs 13.4kg. If you were to buy the 65-inch model the TV is 37kg without its stand. There's a solid black bezel that surrounds the screen, and beyond that a clear glass protrusion that makes it look like the FX750 is one large pane of glass with a screen in the middle. A glass construction didn’t sound too appealing when I first read about it, it screamed reflections and light glare, but during my use, it is better than some of the older glossy TVs I have used in the past. The glass construction pretty much guarantees this won’t be something that is easy to fix should you experience problems later down the line. At the moment if you register your TV with Panasonic, you can claim a 5-year warranty giving you some extra piece of mind. All the ports and connections are located on the back of the panel itself, this means you have the top half of the display being ultra-thin, then there is a large thick area where everything is plugged in. I am fine with this design choice, but it is not quite as elegant as shifting everything to a separate unit like Samsung does, which gives a bit more flexibility with installation. The most important part of the TV is how well the panel performs. As I don’t do many TV reviews, it is hard for me to form an objective opinion of the screen. I can’t compare the display against competing models this year, nor do I have the tools to test things like colour accuracy or peak brightness. So, all my opinions are highly subjective. That being said, I have come away pleased with the performance of the 49FX750. Out of the box it ships with normal viewing mode, but it is generally advised to use True Cinema mode, I found that a little on the dark side initially, and for day time TV I quite like to use the normal mode, but for movies and any HD content the True Cinema mode appears to perform very well with its default settings. It is likely you will be able to achieve better results once the community crowdsources the ideal settings. In my opinion, the colour accuracy seems superb, with black levels and uniformity being excellent compared to what I am used to. During my use I noticed no severe backlight bleeding, haloing or other faults with the TV. It doesn’t have that retina-burning brightness that Samsung models can achieve, but I found the brightness to be more than acceptable based on my standards. Watching Netflix shows in HDR made me realise what I was missing out on with my older none HDR 4K display from Panasonic. I am a big fan of Altered Carbon, and its neo-noir dystopian future setting is perfect to show off the HDR capabilities of this set. Stranger things offers a similar experience, the extra detail provided by HDR helps this fantastic show even better. The Marvel Netflix shows don’t have quite as much spectacular imagery as Altered Carbon, but their dark and gritty nature (except Iron Fist) give the TV a chance to show off its deep blacks. While it isn’t something I would have associated with HDR, The Grand Tour looks exceptional on the TV with vibrant and rich imagery throughout the show. To be slightly more objective about the performance, last year’s EZ750 model received very favourable reviews online, and this model offers a higher peak brightness and claims to offer improved white levels. Overall, it is not going to compete with OLED, and Panasonic wouldn’t want it to, considering they sell OLED TVs for much more. If you want a semi-affordable TV with superb picture quality, I don’t think you can go far wrong with this. I have to admit I usually am not a fan of the smart features of TVs, I find it better to invest a small amount and buy something like the Amazon Fire 4K or Nvidia Shield. I did have one of Samsung’s first TVs with smart functions, and it was terribly slow, so my opinion is tainted a little. The Panasonic does do a superb job though, the OS is fast and responsive, and the dedicated Netflix button means it is quicker for me to use the TV than Amazon to watch Netflix. The remote itself is a little old-fashioned looking and clunky, but it works well. As well as the dedicated Netflix button you can map another app to the my app button, so access Amazon Prime Video can be just as quick. Similarly, Freeview Play is superb for providing easy access to all the catch-up channels and the option to record TV shows. I did some limited tests on the DLNA and USB media functions, and the TV was able to access all my media without issue. Overall, I found myself using the TVs built-in functions more than the Amazon 4K for all streaming services, it was quicker to access the apps, and they all ran smoothly. Catch up in particular works better on the TV. The main downside is the lack of Kodi or Plex for my local content, DLNA does work for this, but you don’t get the excellent library management these apps offer. I use a Bose soundbar for my primary audio, so my audio testing was limited. If you are spending over £1000 on a TV, you would be mad not to invest in a sound bar or other speaker set up. That being said, if you are just watching daytime TV you don’t necessarily need your 9.2 speaker system up and running, and this TV produces adequate audio. There is a decent amount of stereo separation, and at moderate audio levels, there was not any noticeable tininess or distortion the TV was capable of producing a reasonable amount of base. Overall, I have come away very impressed with the FX50. With the 49-inch model, there are only really 3 options to choose from at this end of the market, this TV priced at £1,049 the Sony KD49XF9005 at around the same price or the Samsung QE49Q6 costing around £200 more. I have not viewed the Sony, but if you want a high-end 49-inch TV then the Panasonic FX50 looks like a great option. Moving up in size it still represents an attractive buy costing just £1,299.00 for the 55-inch model and £1,799.00 for the 65-inch model. I found the TV offers excellent black levels, producing a decent level of brightness and what I think is good HDR performance. The smart TV features are superb and I would argue one of the best options on the market. PreviousSamsung Galaxy Note 9 Launches for £900 but can it compete with OnePlus and other low cost options?